You can settle the payment of your order comfortably and safely either by credit card, Paypal or prepayment via bank transfer.Security? Here you are on the safe side. Our website is secured with an Extended Validation SSL (the green lock in the browser address bar). The extended validation SSL certificates (EV SSL) generate an additional visual trustworthiness indicator when opening a website by displaying information about the owner of the website. 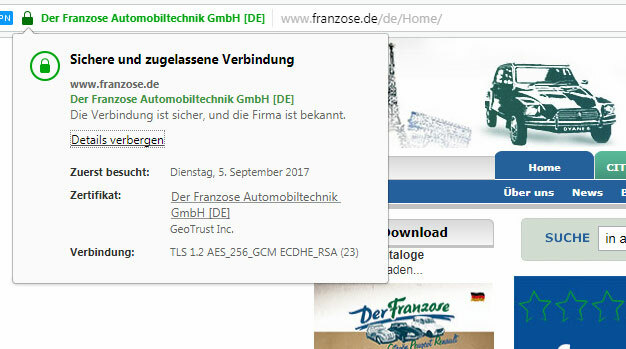 Through the EV SSL, the browser appears green which indicates the secured website. Paypal is one of the most secured mean of payment. For payment via Paypal, you will first of all need to set up a paypal account (if not existing). You will thus have to provide only once either your bank or credit card details. For further purchase with paypal, you will have to log in on your paypal account with your personal data (email address) and your password. If you should not pay via PayPal.com immediately after closing your order we send you an e-mail with the payment information. We send the goods immediately after receiving the invoice amount. We accept payment via VISA, Mastercard or American Express. All credit card details are transmitted to us only in encrypted form. For payment via credit card, we will need the credit card number, expiry date as well as the CVV (Card verification value). These are the last three digits to be found on the back side of the card for Master Card and Visa. The CVV for Amex is to be found on the front side of the card and consists of 4 digits. For orders via telephone, please do communicate these information to our customer service agent if you choose to settle payment via credit card. The amount for the invoice has to be paid in advance. For all orders on prepayment made on our website, you benefit from 3% discount. You will receive the invoice from the account department including the total amount, the invoice number as well as the bank details for the bank transfer. Please wait until you get the invoice before proceeding with the bank transfer which has to be done within 7 days after receipt of invoice via fax or Email. The ordered parts are then reserved for you and the parcel will only be dispatched after receipt of your payment. Kindly take into consideration that some bank transfers (depending on banks) can last from 1 to 3 working days. According to this, there might be some delay for the delivery of the parcel. Please note that all bank fees (national and international) are at your charge. Taxation and customs duties: For deliveries to the non-EU as well as non-Schengen countries, additional cost in regard to customs, fees and taxes will arise..